Back in 2002 former PayPal Mafia member, Reid Hoffman created the professional social network that would grow until it was acquired by Microsoft for $26.2 billion in December 2016. In this article, we’re going to see what are LinkedIn secrets and how its business works. In fact, a well-designed business model is a primary driver of value for any company in the long run. So how did LinkedIn become a company worth $26.2 billion? We’re going to focus on two aspects. First, how LinkedIn makes money. Second, what customers it serves. Third, we’ll see how, when and why it makes sense to build a multi-sided platform, just like LinkedIn has done. LinkedIn is a professional network where people can manage their professional brand, while recruiters can find candidates to fill job vacancies. In addition, it has a platform related to education and skills developments. Last but not least LinkedIn offers the opportunity to sponsor products or services with paid advertising campaigns. According to Microsoft‘s annual report for 2017 LinkedIn has more than 500 million users. Let’s look at each of them more in detail. Hiring and Learning & Development products. Hiring provides innovative recruiting tools to help our customers become more successful at talent acquisition and professional development. Our products aim to be the most effective way for enterprises and professional organizations to efficiently identify and acquire the right talent for their needs. Learning & Development provides online education courses that aim to make it easy for professionals to accelerate their careers and realize their potential by learning new skills. Within the hiring process, there are also other features and products, such as referrals, job slots, job posting and so on. The primary business model here is subscription-based. Back in 2015, LinkedIn had bought an online learning company called Lynda for $1.5 billion. Lynda was integrated into LinkedIn as the learning and development platform for professionals. In short, subscription members can get access to thousands of professional courses. Thus, this segment of the business is subscription-based as well. The last segment is related to the premium subscriptions members. The differentiation between the subscription-based model and advertising model is not as simple as it seems. In fact, within premium subscriptions, you can have access to advertising features (like InMail Messages); therefore, even though the LinkedIn business model is mainly subscription-based. That is more diversified. In fact, it is undeniable that part of the value of the professional network comes from the leverage the businesses can make of the LinkedIn members’ base. However, in this article, we’re going to look at pure financials to understand where LinkedIn is right now regarding growth and how the company’s business model is influencing its value creation. Before Microsoft had bought LinkedIn, the professional network was listed. In fact, when the acquisition was announced the company’s stock jumped to $195.96 to align at the price of the offer from Microsoft. It was a premium of over 40% compared to the market capitalization of LinkedIn previous to the announcement; when the acquisition was official LinkedIn also delisted its stock to join Microsoft. In 2017 LinkedIn revenue was $2.3 billion, which primarily comprised revenues coming from LinkedIn Talent Solutions. Instead, Operating expenses included $2.3 billion related to the LinkedIn acquisition. Where does LinkedIn get its value? Undoublty from the platform it was able to build, which serves both hands of the professional industry: HR managers and Professionals. 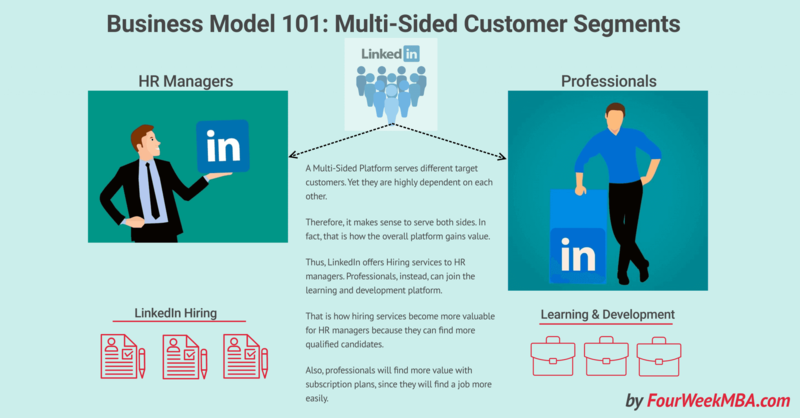 Regarding the business model, LinkedIn could be defined as a Multi-Sided Platform. In fact, one of the key aspects of a business model is the customer segment your organization serves. In short, to whom you’re selling your products or services. In short, although LinkedIn serves different target customers. They are highly dependent on each other. In fact, LinkedIn gets its overall value by offering services for both HR managers in need of qualified candidates; and professionals looking for career opportunities. Therefore, If I were an HR using LinkedIn hiring that would help me find qualified candidates. At the same time, the Learning & Development platform allows LinkedIn members to get more qualified. Which in turn, increases the value of the hiring services as more qualified people are available. To assess the value of a Multi-Sided Platform financial metrics are useful but a more holistic approach helps. As of 2017 LinkedIn generates almost $2.3 billions in revenue. The company has been integrated into Microsoft as of the end of 2016. Therefore, to understand how it is doing from the financial standpoint you’ll have to look at the financial data filed by Microsoft. In terms of Business Model, LinkedIn focuses on two main patterns for generating revenues: subscription-based (Hiring, Learning & Development) and advertising (Marketing Solutions). The overall platform gets value by integrating those services and serving both the hands of the professional industry (HR managers and professionals). That makes LinkedIn a multi-sided platform.